Angel-girl was a very special dog. Kay’s backyard must have been a dump site at some point in time, Angel would dig up little treasures and bring them in the house—tin cans, pieces of rugs, old whiskey bottles, etc. But, the day she tried to get the toilet seat through the doggie door was a “Kodak moment.” It was then Kay realized that Angel desperately needed a job and had quite a nose on her. What better job than to search for lost and missing people? Kay and Angel traveled all over Virginia, teaching children about what to do if they get lost in the woods and what they should to carry with them. In addition to search work, Angel was also a Therapy Dog and visited Teenagers with special needs at the local High School for several years. The first time Angel entered the classroom, there was a boy in a wheelchair who was terrified of dogs. Eventually, his face would light up when he saw Angel, and he was able to walk her around the school in his wheelchair. Angel even represented Therapy Dog International in several fashion shows. 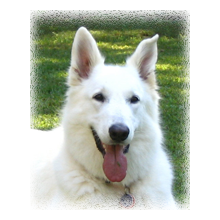 In 2007-2009, Angel was a guest of honor at the Miss Spotsylvania Beauty Pageant in addition to getting first place in the White Shepherds Club of Canada show in August 2006 for Best Altered Female.